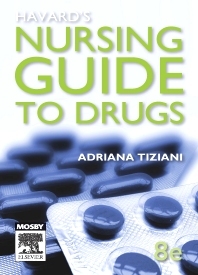 Havard’s Nursing Guide to Drugs 8e is an essential resource for all nursing students and practitioners. The information presented in this user-friendly guide can be accessed either by therapeutic class or by system. Each section is introduced by a clear description, followed by the A–Z of drugs within the given therapeutic class. It includes the action, use and dosage of each drug as well as important nursing points and nursing cautions. This comprehensive guide includes both trade and generic drug names for the reader’s ease of use. As with previous editions of Havard’s Nursing Guide to Drugs each drug is independently reviewed with obsolete drugs being removed and new drugs added. Each existing drug is also independently examined so as to ensure that its use, doses, side effects, contraindication and precautions comply with that of the Therapeutic Goods Association (TGA).